According to Yifan Zhang, a 2010 graduate of Harvard College, part of the problem is that customers see gym membership fees as money spent, or “a sunk cost, especially if you pay at the beginning of the year.’’ That prompted the idea for Gym-Pact in Boston, which she created with Harvard classmate Geoff Oberhofer. Gym-Pact launched a pilot program in October with a small group of participants, including some first-time gym members, at Bally Total Fitness in Boston. 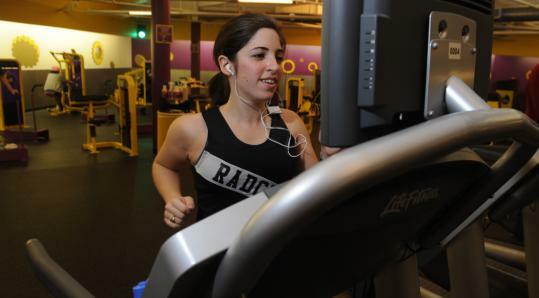 A second group of about 20 customers kicked off 2011 at Planet Fitness locations in Government Center in Boston and Porter Square in Cambridge. Gym-Pact negotiated a group rate with Planet Fitness, then paid the membership fees for participants, who in return for a free membership agreed to work out at least four times per week. If they fail to follow the schedule in any one week, the participants pay $25. If they leave the program for any reason other than injury or illness, they will pay $75. For now the fees will be used to pay for the gym memberships and to build a financial aid fund. “We don’t want to profit off of people’s failures,’’ said Oberhofer, adding that the company will eventually make money from referral fees and revenue-sharing affiliate programs with gyms. Gym-Pact is somewhat experimental. Based on feedback from the two groups, Zhang and Oberhofer plan to tweak the fee structure to allow it to be customized to a customer’s goals. Future iterations may include a combination of discounted gym memberships and smaller penalties that apply daily rather than weekly. Real accountability was critical, but collecting attendance data from gyms proved problematic, so the partners created a text-messaging system. E-tokens are kept at the gym’s front desk, with a digital password that changes every 60 seconds. Participants text the password on their way in and out of the gym. Bill Aulet, managing director of the MIT Entrepreneurship Center, said motivational strategies have proven effective elsewhere. Aulet warned that if Gym-Pact is too effective, it could stretch resources at participating gyms, a dynamic he has observed at some popular Groupon merchants.